Map maker : AMBROSI, Fr.. Date : Bassano del Grappa, .1780. Size : 13.5 x 18.7 inches. / 34.2 x 47.5 cm. 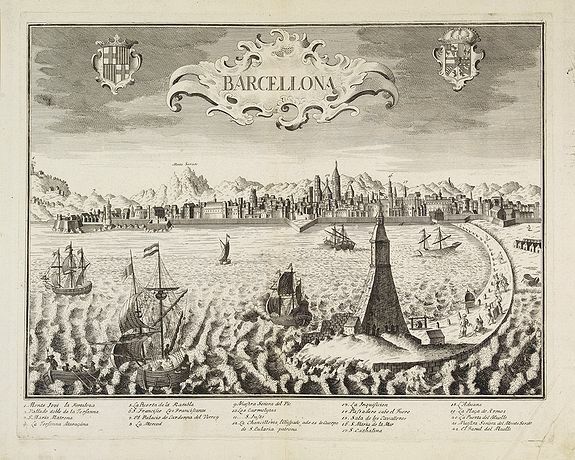 Description :Extremely rare town-view of Barcelona. Engraved by Francesco Ambrosi. With a numbered key (1-37) to the principal places of interest in town. The author is Giovanni Remondini (1713-1773) a Venetian cartographer and publisher. The Remondini dynasty operated in Bassano del Grappa (Vicenza province, Veneto), Italia in XVII - XIX centuries. The founder, Giuseppe Antonio Remondini started his publishing business as early as 1640. He died in Bassano in 1711. Other Remondini members are Giovanni Battista (1713-1773) and Francesco(1773-1820).